Nicole Watson shares a rented apartment in New York’s Brooklyn neighborhood with little hope of jumping into the city’s pricey real estate market in the near future. At 38, Watson has nearly six figures in student loan. “It’s enough to buy a high-end Mercedes Benz,” she says jokingly. 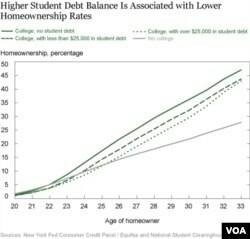 Fewer people with student loan debt are able to pursue homeownership, according to a recent study by the Federal Reserve Bank of New York. “Student debt has increased more than fivefold over the past 14 years,” said bank president and CEO William Dudley, adding that delinquency rates for these debts remain high. Students at four-year colleges graduate with an average of $37,000 in student loan debt, a number reflective of rising tuition costs. “Our analysis reveals that those with significant student debt are much less likely to own a home at any given age than those who completed their education with little or no student debt,” said Dudley. He says there are many factors resulting in a high debt burden and repayment rates including high college dropout rates and evidence showing that graduates from some colleges have had trouble finding good-paying jobs. Like many Americans, this was done with student loans. But Watson, like many first-generation college students, was left trying to figure out the financial aspect of higher education on her own. She says this inexperience in dealing with financial aid and student loans led to some poor decisions, including taking out an unsubsidized loan. Unlike federally subsidized loans which don’t accrue interest until six months after graduation, the interest on unsubsidized loans begins to accrue as soon as the funds are dispersed and can be added to your principal loan balance if not paid immediately. It says the increased reliance on student debt may have important implications for the housing market, economic growth and wealth distribution in the U.S.
How will you finance your college education?